A new form of cell division within cells of the human body has been discovered. Klerokinesis, the newly discovered process, is believed to be responsible for ensuring that the division is without fault. Cell division is also responsible for replacing and reparing old and damaged tissues. Fundamentally, the definition of cell division is when the parent cell divides into two or more cells known as daughter cells. Cell division is the foundation of the growth of an organism including humans. From inception up to the adult stage, cells continuously divide to develop tissues, organs, and ultimately, the organism itself. The transference of DNA or the genome of each cell to the daughter cells is the heart of cell division. At each division, genetic information is copied to the daughter cells ensuring its integrity. In humans, the cell stops dividing after an average of 52 divisions. This is known as the Hayflick limit and at this stage, the cell is termed as senescent. The cells stop dividing because each division shortens the protective parts of the DNA which at the Hayflick limit is all consumed. Researchers testing a theory about how a cell divides and how cancer begins have discovered a new type of cell division, the fundamental process by which cells replicate, Mark Burkard, MD, PhD, reported at the American Society for Cell Biology Annual Meeting, Dec. 17 in San Francisco. 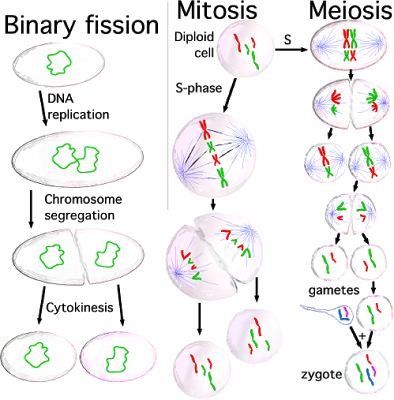 The new type of cell division, which the researchers named klerokinesis, could be an evolutionary failsafe mechanism that could rescue a range of cell functions during embryonic development to genetic repair that can become abnormal if cell division fails to produce normal cells, said Dr. Burkard of the University of Wisconsin, Madison. "We hope to learn how to promote klerokinesis to help prevent cancer," he added. Numerous cell divisions occur once a single egg is fertilized. The number of mitotic cycles is estimated at ~1013, about 25 times the number of stars in our galaxy, according to Dr. Burkard. Beyond number, accuracy also counts in mitosis and was an early concern of Theodor Boveri, PhD, the German cell biology pioneer who in 1914 published the hypothesis that mistakes that occur when chromosomes divide during the mitotic cell cycle would lead to aneuploidy, characterized by too many or too few chromosomes in the resulting daughter cells. Such abnormal cells, Dr. Boveri believed, would lead to the out-of-control cell division that is a hallmark of cancer. During the almost 100 years since Dr. Boveri's hypothesis was published, cell biologists have found considerable evidence that aneuploidy can promote the transformation of normal cells into cancer. Until the recent arrival of live single-cell videomicroscopy techniques, Dr. Burkard explained, it wasn't possible to examine a key feature of Boveri's theory: that aneuploidy results from the failure of cytokinesis, the separation of the cell membrane between segregated chromosomes to form two daughter cells. A—Binucleate RPE1 cells labeled with H2B-GFP undergoing klerokinesis (interphase fission). B—RPE1 cells labeled with H2B-GFP and mCherry-CDT1 undergoing klerokinesis; presence of mCherry-CDT1 indicates that this occurs prior to S-phase of the cell cycle. C—Klerokinesis in the same cell line as panel B in the presence of aphidicolin, which prevents DNA synthesis, indicating that S phase is not required for this process. Dr. Burkard and Wisconsin colleagues allowed human retinal pigment epithelial (RPE) cells in the lab to undergo karyokinesis, the orderly separation of chromosomes in mitosis, but blocked cytokinesis, the actual division into two daughter cells. This process resulted in single cells with two nuclei, termed binucleate. Binucleate cells were allowed to go through more mitotic cycles and proliferate. The researchers said that they were surprised that one-third of the binucleate cells generated healthy daughter colonies. In addition, the majority of their progeny had chromosome sets that perfectly matched the original first-generation RPE cell. "This made Boveri's random chromosome assortment seem rather improbable," Dr. Burkard explained, "so we carefully observed the cells by time-lapse microscopy to see how this might be occurring." They discovered that cells with two nuclei got stuck in the first growth phase of the cell cycle long enough for them to stretch apart, dividing the cytoplasm into two cells, each with its own nucleus. The process neatly preserved the accurately separated chromosome sets. Further work showed that these cells managed to divide without the usual proteins required for division of cell membranes in cytokinesis. "We concluded that we were observing a new type of cell division," Dr. Burkard said, "which we term 'klerokinesis.' Klerokinesis is derived from the Greek root for allotted inheritance, chosen because each daughter inherits a full set of chromosomes. Klerokinesis is a primitive mechanism of cell division that appears to be preserved in humans, as similar divisions have been observed in organisms such as slime molds, he added.